In Atlanta, it’s very possible. Termites can go undetected for years before an untrained eye will detect visible signs of termite destruction. Even as trained professionals, we can only physically inspect roughly 20-30% of a typical structure. That leaves 70-80% of your home inaccessible for visual inspection! Even infrared camera technology has been unsuccessful in identifying and determining areas of active termite infestation. Since no individual can see inside your walls or underneath floor coverings, your best option is to take preventative termite control measures. Termite damage is extremely expensive to repair and is rarely covered by your homeowner’s insurance policy. The cost of a termite treatment plan is far less than the cost and inconvenience that you could face in repairs. We also provide property owners and real estate agents in Milton, Alpharetta, and the Atlanta metropolitan area, with quick response times for termite clearance letters. The Sentricon® Termite Colony Elimination System is the effective, environmentally responsible way to protect homes from termites. That’s why it’s the product of choice for millions of homeowners and used to protect many national landmarks, such as the White House, the Statue of Liberty and Independence Hall. The Sentricon System has been proven to eliminate the termite colony — not just individual termites. This fact is backed by extensive third-party research — including 30 university studies and 45 published scientific articles — as well as more than 15 years of real life success. That gives you and your family greater peace of mind. Recruit® HD termite bait is immediately available to termites when they enter the stations because there’s termite bait in EVERY STATION from day one. WATCH THE VIDEO ABOVE FOR MORE INFORMATION NOW AND CALL FOR YOUR FREE INSPECTION TODAY! Termidor®, the only liquid termiticide with characteristics of both a baiting system and a traditional liquid residual, kills termites as it is ingested, makes direct contact with termites, and by means of its unique transfer effect. When the pests come into contact with Termidor®, they transfer it from their body onto the other members of their colony. The colony then becomes contaminated and is ultimately eliminated. Termidor® is America’s #1 termite defense product and one of the most tested termite solutions in history! Before Termidor® was made available, it was subjected to rigorous termite control testing by the USDA Forest Service including 10 years of ground board and concrete slab trials in four states proving Termidor® 100% effective against subterranean termite control. The cost of termite treatments and termite control services vary depending uparon the size and type of property to be protected from termites. We offer complimentary inspections and free estimates for home termite control in Atlanta, commercial property termite control and other termite related services. We provide property owners and real estate agents with quick response times for termite inspections and termite clearance letters. 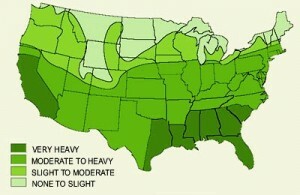 Termite infestations in Atlanta are among the most severe in the United States. 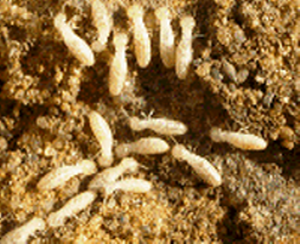 Georgia is home to almost every species of termites found in the United States including subterranean termites, drywood termites, and dampwood termites. If you choose North Fulton Pest Solutions to provide a full minimum standards termite treatment on your home and your termite problems aren’t totally resolved within 120 days of your initial termite treatment, we will keep coming back over the next 30 days until they are resolved – AT NO ADDITIONAL CHARGE TO YOU. *Certain restrictions and qualifications apply. See the terms and conditions of our service agreement for more details. To receive more information, contact our office or ask your North Fulton Pest Solutions representative for more details and to find out if your home qualifies. Applies to annual service agreements only. Customer agrees to accept services as set forth in service agreement. 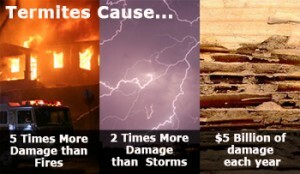 There are other pests which can damage your home that may resemble termites, or exist because of termites. From carpenter bees which chew on wood trim to ants that invade to prey on termites, we offer full pest control services in Atlanta.